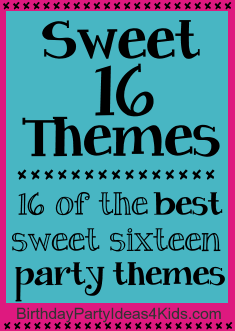 Sweet 16 Themes for a Sweet Sixteen Birthday Party! The best party themes for a sweet sixteen birthday! Sweet 16 ideas and how to make the party special with fun games, activities and special party ideas to make the party memorable. 16th Birthday Party ideas - for girls and guys - venues and fun ideas. Everyone's favorite tea party theme! Add some great decorations, fun games and a little mad imagination and the Alice in Wonderland theme is always a great choice for a sixteenth birthday! See our page full of Alice in Wonderland party ideas for some inspiration. Fun in the sun party ideas with a beach theme are always a big hit with sixteen year olds! See our Beach themed party ideas for great ideas on decorating, party food, games and more! Simple and delicious! A Chocolate party theme would be great paired with a Chocolate Spa theme or a large chocolate candy bar filled with containers of different chocolate treats during a Sweet Sixteen sleepover! Have friends over for a sweet sixteen dance party! See our Dance Party Ideas for the best way to set up a dance party, games, activities, decorations and party food ideas! Make the Sweet sixteen party one to remember by taking glamour photos of all the party guests. Set up an inhouse (or travel to a studio) photo shoot with a photographer. Bring in professionals to do hair and makeup and ask guests to bring a few changes of clothes for their photos. Glow in the Dark or Neon Glow parties are fun by on their own or pair them with a dance party. White shirts and colored highlighters are a great party favor and show up great under black lights. See the Glow in the Dark party theme page for fun ideas on party food, decorations, games, activities and more. Make Hollywood the sweet sixteen theme - stars walk of fame, the large Hollywood sign, dark sunglasses for all guests ... perfect for sixteen year olds who love the lights and fame of Hollywood. Decorate with a Hawaiian theme and give guests grass skirts to wear for the party. Lots of fun no matter what season the sixteenth birthday is in! See our Luau party theme page for fun ideas, games, activities, decorations and invitations and party food. Make the Sweet 16 a real party with a Mardi Gras theme! Masks, beads and lots of fun music! Our Mardi Gras party ideas will help you create your own perfect party. New York, New York! The big apple is a great party theme for a sweet sixteen party! We've combined our favorite New York party ideas on one page - decorations, invitations, party food, games, activities and more fun party ideas. An Outdoor Movie party theme is really fun and a great way to hang out with friends and enjoy a great movie! Set up a large screen outside (you can hang a white sheet) and project a current movie or an old favorite like Sixteen Candles onto the big screen. Have guests gather around with sleeping bags, beach towels, lawn chairs or beanbags and have fun under the stars. String white lights in trees and around the party area to look like stars. Pop popcorn and serve in small tubs or brown bags, serve movie sized boxed candies, hotdogs, nachos and sodas. Create a beautiful party theme filled with Parisian influences. Eiffel towers, flowers and funny mimes all add to the Paris party theme - see our Paris page filled with ideas for games, activities, party food and more. Pool parties are always fun! Make the 16th birthday special with the fun ideas from our Pool Party page! And there's also a full page of Pool party games to play with friends! Rock out on the 16th birthday with great music and some fun ideas from our Rock Star party page. Relax and have fun with friends with a Spa party theme. Use these fun Spa Party Ideas and also our homemade spa recipes that guests can make and use. Have stations for pedicures, manicures and facials. Make some homemade spa treatments or bath fizzies for party favors. Sugar and Spice and everything nice! Create a party theme around the fun Sugar and Spice rhyme. See the Sugar and Spice party ideas page for ideas on decorations, invitations, games, activities and more!